High end coaxial cable (RCA/RCA) featuring the same construction as our Silver HD XLR including multi strand copper and silver conductors and silver braided shielding. 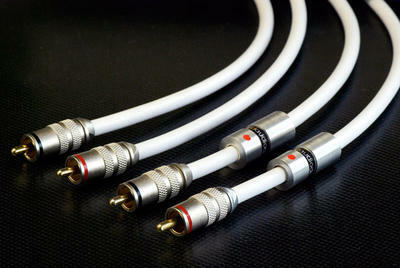 Professional RCA connectors with Teflon dielectric and machined to fit the 12mm gauge. A white silicone outer jacket offers enough flexibility and outer insulation for intensive use and to resist UVs as well as chemical agents. AU-4g machined aluminum ring and shield.